I find it hard to keep focused on one thing, especially if its development or production takes some time. I still have not completed a display model of the Bounce and Tier Box. I have one section still to complete. Perhaps next week. Perhaps not. I find myself easily distracted by other interesting design challenges or ideas which just have to be tried out before I forget them (damn my aging memory) or I get distracted from them, too (damn my ADD). 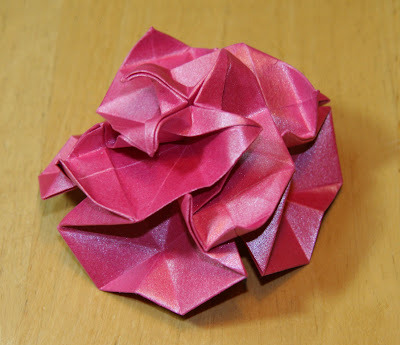 This week I found myself designing flowers with the intention of making a kusudama. So, back to this week's flowers. 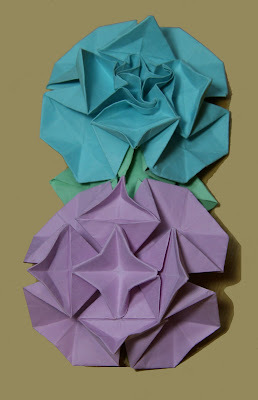 I discovered that I could turn a double square twist into a variety of interesting flowers. The original flower has a four-petal star-like center. It's the mauve one. The next version has a central curled twist. It's the lilac one. 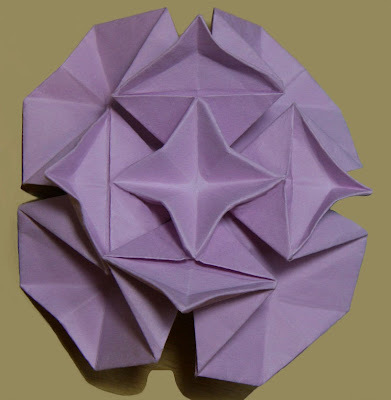 The third version has four raised points in the center. It's the peach colored one. It's also the one used for the collection. 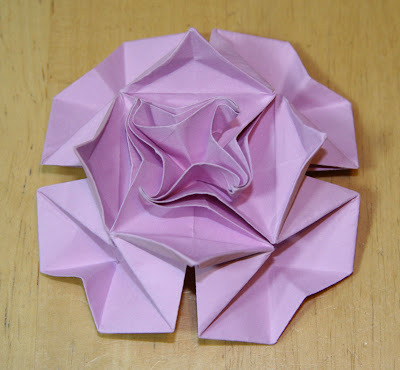 The fourth version arranges the petals differently and looks something like a four-petaled rose. It's the shiny red one made from Stardream paper. I found a way to provide them with connectors which double as leaves. 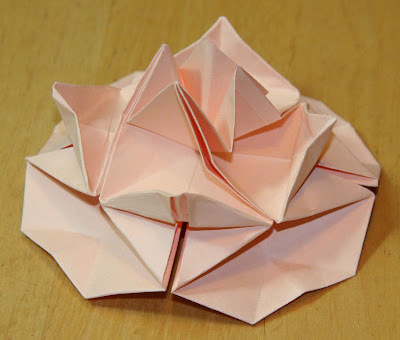 All that remains to be done before they can be properly connected into a polyhedron is to design a triangular connector with bigger leaves. 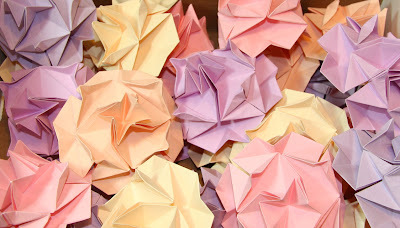 Undaunted by this unfinished task I have folded a box full of color coordinated copy paper flowers in readiness. Today's job is to begin folding the straight connectors.